A Software Engineering major turned Product Manager at Twitch. Passionate cryptocurrency analyst and writer. One of the greatest cryptocurrency feuds in 2018 is the fight between anonymous Twitter user Bitfinex'ed and the cryptocurrency exchange, Bitfinex. Bitfinex'ed was an ardent critic of the latter and fought his battles on Twitter and Medium. Bitfinex, one of the largest cryptocurrency exchanges in the world, was accused of using the US dollar stablecoin, Tether, to manipulate the cryptocurrency market. This started a major controversy where speculators predicted that Tether will collapse, taking the entire cryptocurrency market with it. The feud culminated with the DOXXing of Bitfinex'ed. Today, Bitfinex and Tether are still chugging along and Bitfinex'ed continues his crusade against cryptocurrencies on Twitter. This is the story of the fight between Bitfinex'ed and Bitfinex. Quick Primer: What Is Tether? 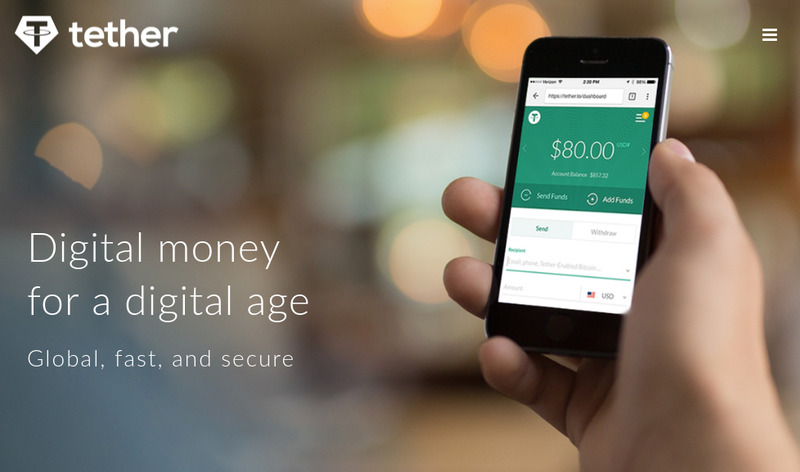 Tether is a US dollar stablecoin. This means that it's a cryptocurrency designed to be worth exactly $1 USD. The peg is maintained with the claim that every Tether is backed by $1 USD held in reserve in a bank. Users ideally can buy Tethers with USD and redeem Tethers for USD. Tether has a major presence in cryptocurrency markets. It's widely used as a safe haven in cryptocurrency exchanges that do not support "real money" deposits. From January 2017 to February 2018, the outstanding supply of Tethers grew from $10 million to $2 billion. According to this Wall Street Journal article, Tether accounted for "10% of the trading volume of Bitcoin" in early 2018. As you can imagine, the widespread use of Tether means that its sudden disappearance will be catastrophic for the cryptocurrency market. 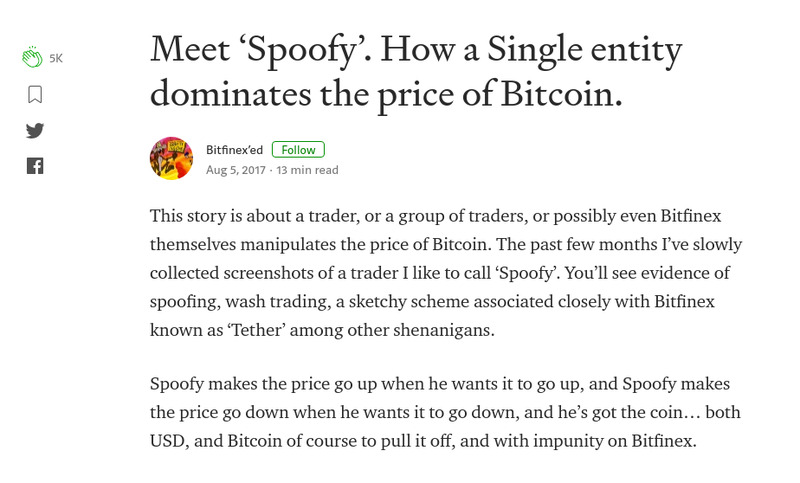 Bitfinex'ed made his first significant public appearance in early August 2017 with an explosive Medium article titled, "Meet 'Spoofy'. How a Single entity dominates the price of Bitcoin." In it, he claims that Bitcoin's price was manipulated by a shadow entity called Spoofy which spoofs order books to push Bitcoin's price one way or the other. At the time, Bitcoin was at $4k and just started its meteoric ascent towards $20k. The market was highly volatile with tremendous upside and a claim of market manipulation resonated with many people. The article was widely shared and received thousands of "claps" on Medium. Of course, this being Bitfinex'ed, the article also contained a critique of Tether. Riding on the momentum gained from this first article, Bitfinex'ed penned nine more in the next two months, with the focus on Tether and Bitfinex. He rightfully claims that Tether is tightly connected with Bitfinex, even though the connection is obscured from corporate structuring limbo. He also claims that Bitfinex wantonly prints Tethers to buy Bitcoin and manipulate its price upwards. For context, since Tether is a public cryptocurrency, the issuance of new Tethers is completely transparent. This is a Twitter account tracking Tether printing and here's an example of $100,000,000 USDT being created. Due to this alleged wanton printing, Bitfinex doesn't have the cash reserves to cover all outstanding Tethers (around $2 billion at the time) and Tether will collapse if enough people cashed out. That is, if Bitfinex'ed had it his way, criminal charges were filed at Bitfinex and Tether, forcing both to shut down. Bitfinex'ed drove significant attention to Tether and led many to question whether Bitfinex was solvent and Tethers were fully backed. Adding to the fire is the fact that Wells Fargo had previously discontinued its role as a correspondent bank for Bitfinex in March 2017, way before Bitfinex'ed started raising alarms. Bitfinex, as a response to the intense scrutiny of Tether, released a supposed financial audit in September 2017 from its auditors Friedman LLP. Some interpreted the document as a confirmation that Bitfinex was solvent and all Tethers were fully backed. Bitfinex'ed quickly jumped to challenge this interpretation, claiming that the document was simply an internal memo; it was not an official audit statement. To make matters worse for Bitfinex, in November, Tether was hacked with $30,950,010 USDT stolen. Tether swiftly hard forked their blockchain to delegitimize and freeze the stolen USDT. Then, in December, the U.S. Commodity Futures Trading Commission (CFTC) sent subpoenas to both Bitfinex and Friedman LLP, as part of an investigation by the CFTC and the Department of Justice on cryptocurrency price manipulation. Although there hasn't been any public follow-ups from the investigation, it was bad publicity for Bitfinex at a time when it desperately needed the opposite. In January 2018, in another blow to Bitfinex, Bitfinex announced that its relationship with Friedman LLP had ended. Bitfinex just couldn't catch a break. All the while, Bitfinex'ed continued to egg on the Tether controversy by publishing Medium articles and tweeting incessantly. Backing up Bitfinex'ed's attempts to discredit Bitfinex, in June 2018, two reports raising suspicions of Tether were released by the University of Texas and Bloomberg. Although overall public sentiment was agreeable with Bitfinex'ed's accusations and many were suspicious of Bitfinex, the latter had its supporters. 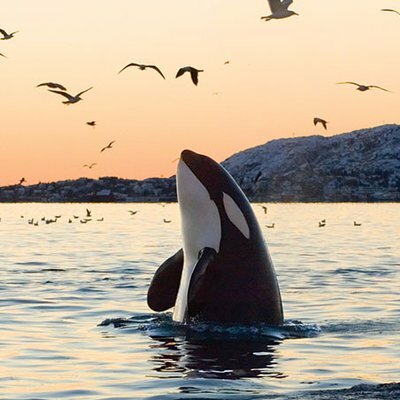 The most vocal of them was the cryptocurrency trading community, WhalePool. Bitfinex'ed engaged in Twitter feuds with WhalePool. WhalePool accused Bitfinex'ed of selling his Bitcoins too early (apparently he sold at $2000). Their logic was Bitfinex'ed was disappointed at selling so early and wanted to bring down the market to make up for his mistake. WhalePool also accused him of running a fraudulent donation drive to raise funds to fight a potential lawsuit from Bitfinex that never happened. In total, 2.49 BTC was raised ($50,000 at Bitcoin's peak price). To be fair to both sides, Bitfinex'ed did hire a lawyer after the donation drive. Here's an article by swapman, a WhalePool administrator, calling Bitfinexed a "sensationalist, liar, fraud, and opportunist". Bitfinex'ed countered by accusing WhalePool community members of being Bitfinex shareholders. 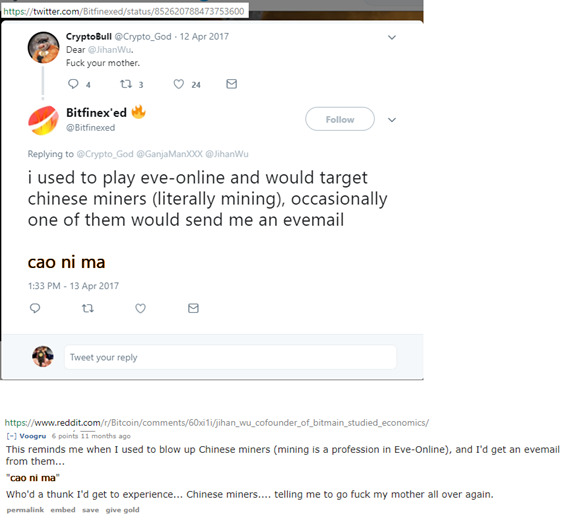 He also accused WhalePool and Bitfinex of attacking him on social media with fake accounts, fake reports, and hacking attempts. 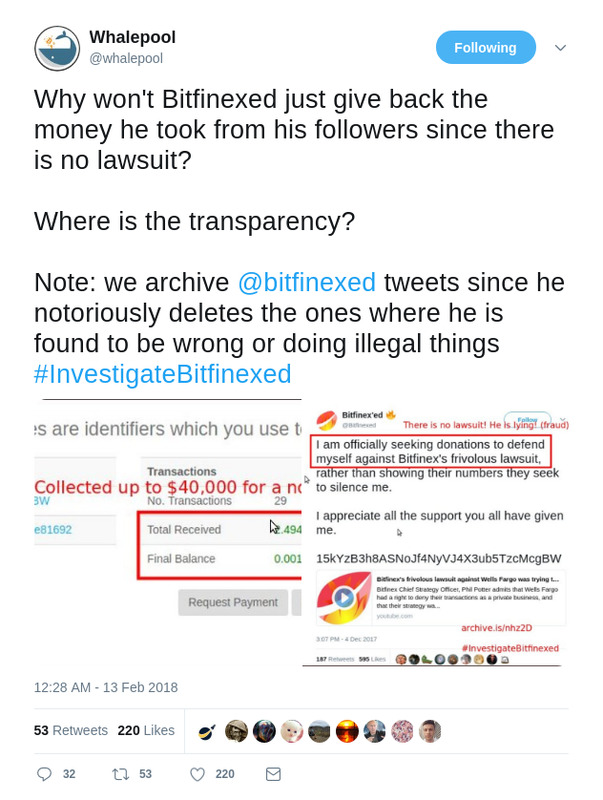 In fact, Bitfinex'ed's Twitter account was suspended by Twitter in February 2018 after numerous reports that it violated TOS by sharing private information. The account was quickly restored after Bitfinex'ed challenged the suspension. 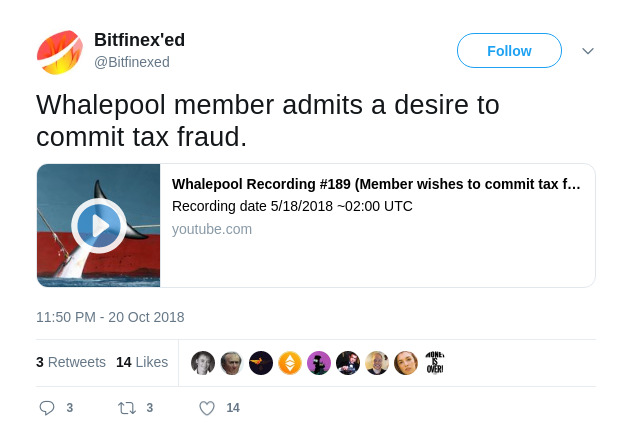 Bitfinex'ed also lurked in WhalePool's public TeamSpeak and published recordings of WhalePool community members discussing questionably legal activities. For example, he shared a recording of one member expressing a "desire to commit tax fraud". He also shared a recording of another member expressing an "interesting in illegal market manipulation of the margin market". Good news finally arrived for Bitfinex in February 2018 when the Dutch bank ING confirmed that Bitfinex has an account with the bank. Although this doesn't alleviate fears that Tether is not fully backed by dollars, it's highly positive for Bitfinex that a reputable bank like ING is doing business with it. Later in June, the law firm Freeh, Sporkin, & Sullivan (FSS) confirmed that Tether had $2.54 billion USD in its bank accounts, nearly matching the $2.55 billion USDT outstanding. FSS was given access to Tether's bank accounts for weeks and released data on how much money the company held on a single day, June 1 (source). However, FSS stressed that this was not an official audit as it's not an accounting firm. However, Tether's general counsel Stuart Hoegner did say that an official audit cannot be obtained since the Big 4 accounting firms were unwilling to engage with Tether due to the high risk and this was "the next best thing". Tether recently announced a new banking relationship with Bahamas-based Deltec Bank. They released a letter, allegedly from Deltec, claiming that it had $1.8 billion with the bank. On October 26th, 2018, Steemit user thinkexclamation published an article with an unassuming title, "Organized FUD - How The "FUD Mafia" Is Plaguing This Industry (Part 4)". In it, they dive into who Bitfinex'ed was. Bitfinex'ed has so far staunchly kept his identity secret, which is wise given the enemies he's made attacking Tether. His downfall was that he tweeted incessantly and thinkexclamation was able to use some of his tweets and matched them with the words of a reddit user, /u/voogru. Altogether, thinkexclamation found 7 commonalities between /u/voogru and Bitfinex'ed, making it subjectively highly likely that they were the same person. So who is /u/voogru? It turns out the username was used in many places: BitcoinTalk, Steam, and Twitter. All three accounts advertised a website, voogru.com. The Twitter account exposed the identity of Bitfinex'ed as Spencer MacDonald, a prolific gamer and Bitcoin trader. Do I Think Tether Is Used For Market Manipulation? I personally doubt this accusation. Correlation does not equal causation. Even though Tethers were often printed right before a Bitcoin price rally, that doesn't mean that these Tethers were used to pump the price. There are other plausible reasons for this convenient sequence of events. For example, price rallies occur when people buy Bitcoin, and to buy Bitcoin, you need to deposit cash into an exchange. When lots of people deposit cash to Bitfinex, they need to print Tether to match the deposits. For Bitfinex, every digital dollar is a Tether dollar. However, for me, the most cogent reason why the Tether controversy story is unlikely is the fact that Tether is a public cryptocurrency. If someone wants to manipulate the market, especially one as large as Bitcoin, they wouldn't do so by printing money on a public blockchain where every action is fully visible. That's equivalent to spitting in the face of a sleeping dragon (i.e. the formidable U.S. Securities and Exchange Commission). That being said, the cryptocurrency market is unpredictable and almost anything goes. Tether might very well spell a short term end to Bitcoin and its decentralized friends. Copyright 2019 © Store of Value Blog. All rights reserved.